For the final boss of Melee's Adventure Mode, see Giga Bowser. For Bowser's Final Smash in Brawl and SSB4, see Giga Bowser (Final Smash). Link fights against Giant Bowser in Melee. Fox battles Giant Bowser in Melee. Giant Charizard, Giant Bowser, and Giant DK ravage New Pork City. Giant Bowser is a minor boss that appears in Super Smash Bros. Melee and Super Smash Bros. Brawl. Giant Bowser appears at the end of Adventure Mode, where he is fought at Final Destination. Under most circumstances, he acts as the final boss of the mode, and defeating him allows the player to finish the mode. However, if the difficulty is set to Normal or higher and the player arrives at Final Destination within 18 minutes without using a Continue, Giant Bowser will transform into Giga Bowser upon being KO'd. From there, the player must defeat Giga Bowser to clear the mode. As a cosmetic change, Giant Bowser uses Bowser's black palette swap if he is fought on Normal difficulty or higher. 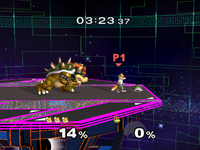 Giant Bowser also appears in Classic Mode as a random giant opponent on Stage 5. Unlike other giant opponents fought on their home stages, Giant Bowser is fought on Fountain of Dreams stage (usually belonging to Kirby). Extra appearances by Giant Bowser include an immensely large version that appears, controlled by the player, in Event 25: Gargantuans against the computer controlled similarly-sized DK. He also reappears in Event 42: Trouble King 2, where the player, as Luigi, must KO him twice. These two events are his appearances on event matches. 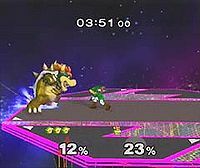 Giant Bowser can appear in Classic Mode as a possible giant opponent on Stage 8. Aside from being a random giant opponent in Classic Mode on Stage 8, Giant Bowser's closest resemblance to being a minor boss like he was in Melee is in the event Event 27: Three-Beast Carnage. He appears alongside Giant DK and new minor boss Giant Charizard, appearing to attack New Pork City. This page was last edited on February 18, 2019, at 07:46.